This post is just a random collection of lesser-known historic images of fish weirs and traps from the Northwest Coast and Interior. There’s lots to learn for archaeologists from historic pictures generally, but the way that images circulate and are reproduced means we often see the same ones over and over again. I’ve found a few archival pics which may be familiar to some, but possibly novel to many. 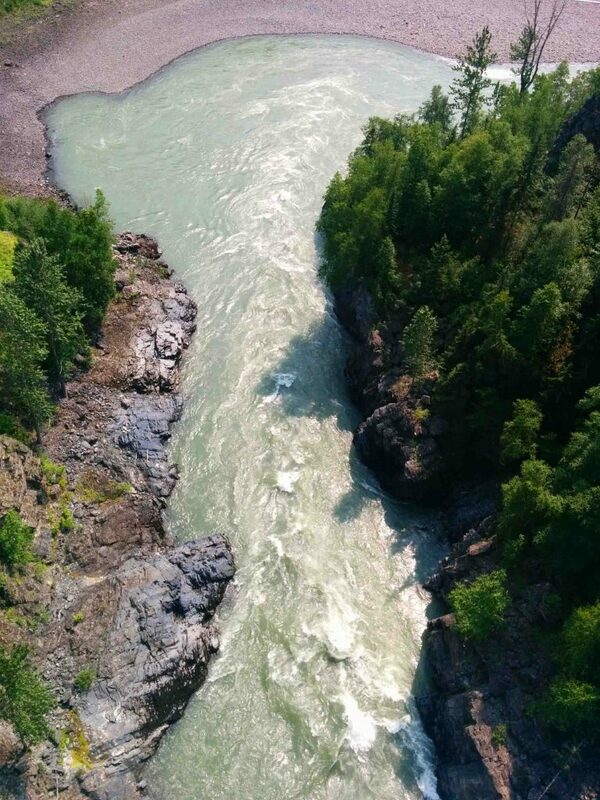 For example, the picture above shows a surprisingly large (to me) stone weir near Hagwilget Canyon, which is a major fishing station on the Bulkley River. I think it must be in the large kidney-shaped pool just downstream of the bridge (map). While the main structure may be partially or wholly a natural cobble bar feature, to the left there is a smaller weir that definitely appears cultural. Note the drying structures and smoke houses in the background, detail below. So, still rustling around the weird world of weirs. The online Alaskan archives have quite a few interesting examples – and, kind of remarkably, a video showing the construction of a weir near Atka, which is on the Aleutian Islands. The trap in the video is pretty similar to a couple of other Aleutian ones in the collection, which I’ll talk about below. It’s really cool to not only see a more-or-less traditional trap being built (look at the rocks being casually dropped down by the wooden fence!) but the photos also show weirs actually in use. There’s probably a lot to learn from these pictures – as any introductory textbook in archaeology will tell you, the more we know about the behavioural context of a given site type, the more we can reliably infer the cultural context when presented only with the archaeological remains. So for one reason or another I’ve been thinking about fish weirs lately. A picture can be worth a thousand thoughts though, so I was happy to see these two shots of a massive weir photographed ca. 1885 on the Puyallup Indian Reservation (map) near Tacoma, southern Puget Sound, Washington. I’m sure these are common knowledge images but for some reason I hadn’t come across them before. If you’re new to weirs I posted something on them before, referencing the monumental reconstruction of one on the Koeye River. Essentially they are a method for controlling the upstream migration of salmon, allowing for stock assessment and selective harvesting. Building Koeye Weir. Photo by Grant Callegari via indiegogo. There’s a pretty amazing new construction on the on the Koeye River (pronounced roughly “kwaay”) on the central coast of B.C. (map). A team has built a traditional style wooden-weir across the river, and are using it for fishery management – trapping, counting, measuring, and gently releasing salmon at the end (and start) of their life cycle. The construction has been documented at the willatlas.com blog, including some amazing photos, and there are posts on the Hakai Beach Institute blog as well. Even better, there is a short documentary. This is actually is a teaser for a longer documentary, which is in the fund-raising stage, and I don’t mind using this blog as a platform to bring this really great project to people’s attention. You can see their fundraising page here. 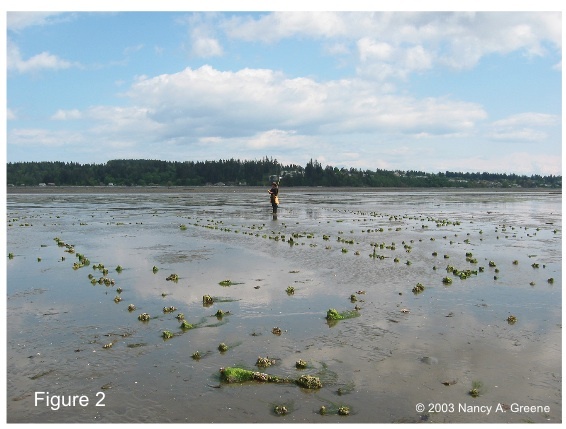 I mentioned the Wetland Archaeology Research Project (WARP) and their revamped website once before in reference to Nancy Greene’s pioneering fishtrap work at Comox. I’m glad to see they have another interesting conference-style poster available for download, this one by Robert Losey (now at the University of Alberta) Scott Byram on the topic of Oregon fish weirs in unusual settings (PDF). If a cow patch strikes you as an unusual setting, of course. In 1989 a nearly complete fish trap was found in Montana Creek, near Juneau Alaska in Aak’w Kwáan Tlingit territory. The cylindrical trap, measuring 3 metres long and 1 metre in diameter, was excavated and found to date to about 600 years ago. The trap was preliminarily reported in Kathryn Bernick’s 1998 book Hidden Dimensions (UBC Press). 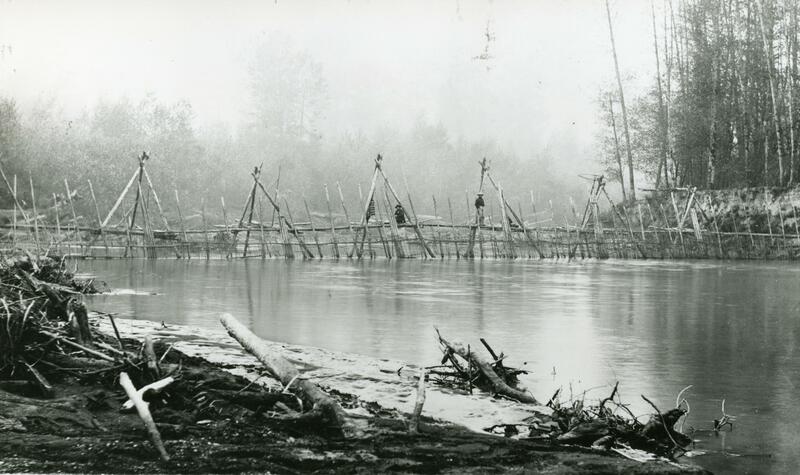 Fishtraps were supported by wood and/or stone weir structures which also act to direct fish into the trap. The trap would be removed at the end of each season and stored nearby or at camp. Of course, being wood, they intrinsically don’t preserve very well except in anaerobic and wet conditions. They are therefore rather rare since they would need to be left in the creek after use in order to preserve. So this one is very unusual, and especially so since it was essentially complete (other than being flattened). All credit to the finder, Paul Kissner, for being alert, recognizing the trap, and reporting it promptly. But now, the fishtrap has become very much a living object.